Apple still allows you to use iTunes for these things, but you don’t have to. Your iOS device can function independently from iTunes, so you should never be forced to plug it into a PC or Mac. When the iPad first came out, it was touted as a device that could replace full PCs and Macs for people who only needed to perform light computing tasks. Yet, to set up a new iPad, users had to plug it into a PC or Mac running iTunes and use iTunes to activate the device. This is no longer necessary. With new iPads, iPhones, and iPod Touches, you can simply go through the setup process after turning on your new device without ever having to plug it into iTunes. Just connect to a Wi-Fi or cellular data network and log in with your Apple ID when prompted. You’ll still see an option that allows you to activate the device via iTunes, but this should only be necessary if you don’t have a wireless Internet connection available for your device. You no longer have to use Apple’s iTunes software to update to a new version of Apple’s iOS operating system, either. Just open the Settings app on your device, select the General category, and tap Software Update. You’ll be able to update right from your device without ever opening iTunes. Apple allows you to easily access content you’ve purchased from the iTunes Store on any device. You don’t have to connect your device to your computer and sync via iTunes. For example, you can purchase a movie from the iTunes Store. Then, without any syncing, you can open the iTunes Store app on any of your iOS devices, tap the Purchased section, and see stuff you’ve downloaded. You can download the content right from the store to your device. This also works for apps — apps you purchase from the App Store can be accessed in the Purchased section on the App Store on your device later. You don’t have to sync apps from iTunes to your device, although iTunes still allows you to. You can even set up automatic downloads from the iTunes & App Store settings screen. This would allow you to purchase content on one device and have it automatically download to your other devices without any hassle. Apple allows you to re-download purchased music from the iTunes Store in the same way. However, there’s a good chance you have your own music you didn’t purchase from iTunes. Maybe you spent time ripping it all from your old CDs and you’ve been syncing it to your devices via iTunes ever since. 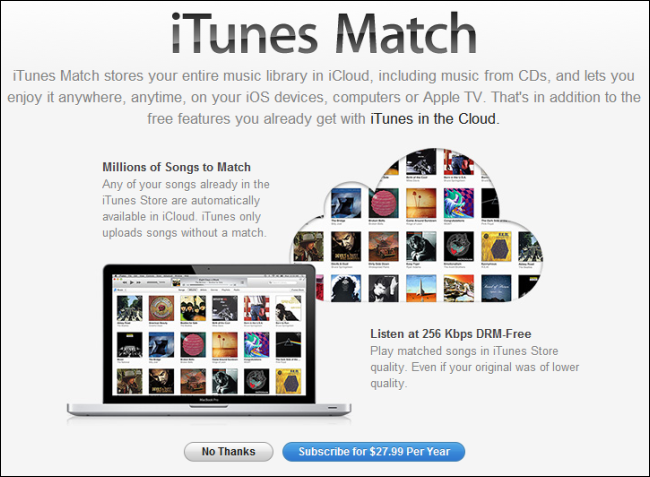 Apple’s solution for this is named iTunes Match. This feature isn’t free, but it’s not a bad deal at all. For $25 per year, Apple allows you to upload all your music to your iCloud account. You can then access all your music from any iPhone, IPad, or iPod Touch. You can stream all your music — perfect if you have a huge library and little storage on your device — and choose which songs you want to download to your device for offline use. This feature is named iTunes Match because it doesn’t just upload music — if Apple already has a song you upload, it will “match” your song with Apple’s copy. This means you may get higher-quality versions of your songs if you ripped them from CD at a lower bitrate. You don’t have to use iTunes to subscribe to podcasts and sync them to your devices. Even if you have a lowly iPod Touch, you can install Apple’s Podcasts app from the app store. Use it to subscribe to podcasts and configure them to automatically download directly to your device. You can use other podcast apps for this, too. You can continue backing up your device’s data through iTunes, generating local backups that are stored on your computer. However, new iOS devices are configured to automatically back up their data to iCloud. This happens automatically in the background without you even having to think about it, and you can restore such backups when setting up a device simply by logging in with your Apple ID. In the days of PalmPilots, people would use desktop programs like iTunes to sync their email, contacts, and calendar events with their mobile devices. You probably shouldn’t have to sync this data form your computer. Just sign into your email account — for example, a Gmail account — on your device and iOS will automatically pull your email, contacts, and calendar events from your associated account. Rather than connecting your iOS device to your computer and syncing photos from it, you can use an app that automatically uploads your photos to a web service. 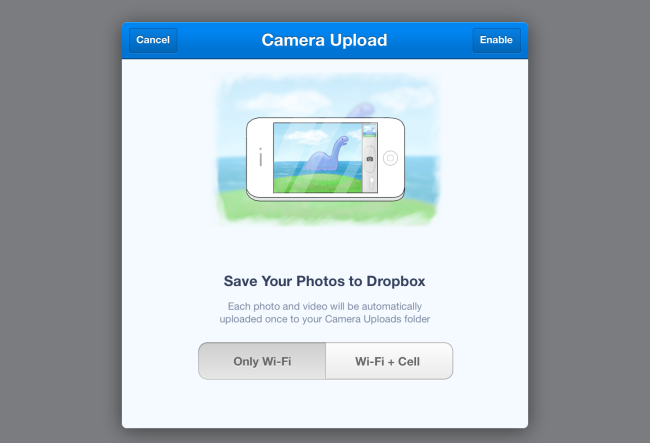 Dropbox, Google+, and even Flickr all have this feature in their apps. You’ll be able to access your photos from any computer and have a backup copy without any syncing required. You may still need to use iTunes if you want to sync local music without paying for iTunes Match or copy local video files to your device. Copying large local files over is the only real scenario where you’d need iTunes. If you don’t need to copy such files over, you can go ahead and uninstall iTunes from your Windows PC if you like. You shouldn’t need it.